Winter is a great time to travel. Snow covers everything in a beautiful white blanket. You’ll have much smaller crowds (or zero) to deal with at active destinations like Taos or Durango. And your photographs have a different look no one else will get. But most people drain the tanks, blow them dry, put in the RV antifreeze, and park it for the winter. Then they miss the best travel adventures when no one else is out there. 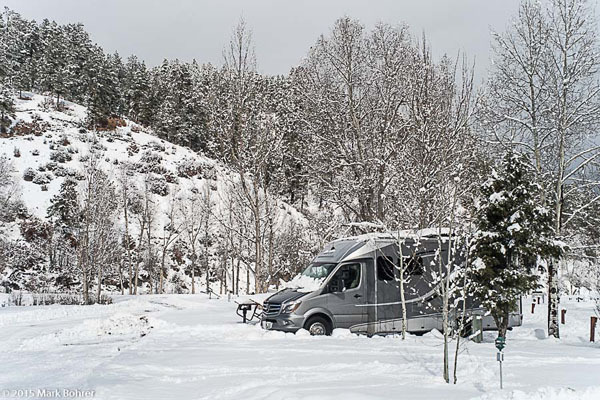 Winter RV travel is easy and fun if you do a few simple things before and during your adventure. Find an RV park with well-maintained showers in heated bathrooms. Have them give you a site not too far from the showers. This shouldn’t be a problem with low winter use at most parks. The RV Parky app (free – iPhone and Android) will direct you to parks, but you may have to call to see if they’re open for winter. The RV park will require you to connect the water supply just long enough to fill up your fresh water tank, and disconnect after that. Then it’s up to you to keep all your tanks warm. However, even with the patch heaters commonly installed on RV water tanks, you’ll likely have problems with below-freezing conditions for any extended time period. So I suggest avoiding the use of your fresh and grey water tanks. Carry bottles of fresh water instead. We have several 1-liter bottles for backpacking / hiking, and we also carry a plastic gallon water jug. We place a plastic bucket in the RV sink, and empty it periodically. Winterize your entire water system before you go. This removes water from all your RV’s pipes, and leaves traces of RV antifreeze in them to prevent freezing and burst pipe damage. The other thing you’ll need to do is carry a stock of RV antifreeze. You can use your RV toilet, but pour the antifreeze into the bowl prior to use, and flush only when absolutely necessary. This avoids premature fill of your black tank, and also avoids freeze damage. Our 2014 Leisure Travel Vans Unity 24TB is very well insulated. With a fairly small heat source, it’s easy to keep warm. To avoid heavy propane use, we run a ceramic space heater at night. Since many RV parks don’t charge you explicitly for the electricity you use, you can run the heater all night. We use the Lasko 6462, available at Amazon. Yes, the microwave is your friend. But you may need to unplug the heater when you run the microwave (or your coffeemaker) to avoid tripping a breaker. Leave one window or ceiling vent cracked open to reduce condensation inside. If you plan on breathing, condensation is unavoidable. Left on your walls, it may eventually lead to mold in warmer temperatures, so minimizing it with one window or vent open is preferable. You’ll also need an ice scraper for your windshield. And you need to carry tire chains that fit. You can be cited and fined for driving on some roads without them in winter. Any auto parts store will have the right size for your wheels and tires. Remember to run your refrigerator – the fridge shouldn’t pull much propane in winter, but you will need to run it to avoid spoiled food when you heat the coach during the day. New Mexico and Colorado offer some of the best winter travel and photography in the U.S. Snow accents on 900-year-old Great Kivas, rock walls with mysterious petroglyphs rising out of the snow, beautiful skies over gorgeous mountain trails, incredible views from ski runs in dry Rocky Mountain powder – it’s all waiting for you here. Subscribe to The Story Behind The Picture here. Want to improve your travel photography at beautiful destinations? Claim your FREE guide to professional photo techniques for pueblo ruins and petroglyphs today and start shooting professional pictures at undervisited World Heritage Sites. Nice artical Mark. Do you worry about the gray and/or black tank, or lines freezing?… or is the residual heat from the inside enough to keep that from happening? Since we use RV antifreeze with flushed effluent and don’t put water down our sinks in winter, we have no freezing problems in cold weather. We use bottled water to drink stored inside the RV, and we disinfect hands with bottled hand sanitizer. We shower at an RV park’s facility.